A friend had told me that Nebraska native Dan Iske was in the process of shooting season 1 of his horror based web series. My thought was that nobody would really care or take it seriously. The world wide web is still trying to find its footing as far as content delivery is concerned so I dismissed the entire thing as being misguided. “Why not shoot a pilot and shop it around to networks like Cinemax or Syfy?” I thought. Little did I know that a year later I would be shooting the entire second season of the series. I had heard of Dan Iske because of his horror feature “THE WRETCHED”. It played the Omaha Film festival several years ago and took everyone by surprise. I think everyone had low expectations at the time simply because so few features are shot here, especially by locals. The film ended up playing to large audiences and winning an award and made several fans out of people including me. It was a true no-budget, DIY effort that showed a lot of promise and I was interested to meet Dan. In late 2010 Dan and I met at a Nebraska Filmmaker gathering. We chatted over a beer and it didn’t take long before we decided that it might make sense for us to work together. By this point Dan had shot the first season of his series and it was getting quite a bit of buzz especially around town. This caught my eye because so many filmmakers end up with a product but have no idea how to market it and find an audience. “THE DEAD HOUR” was different. Series creators Dan Iske, Wendy Iske and Scott Coleman were effectively using the web to find an audience and it was making all the difference. After a series of emails between Dan and I we finally decided to meet and discuss the possibility of me coming to the series as a cinematographer. At our first meeting I told Dan that I wanted to be as involved as I could but based on my schedule I didn’t know if it would be possible for me to shoot more than a couple episodes. Most of my time is spent shooting television commercials and corporate pieces as well as the music videos and shorts. I didn’t think I’d be able to do more than a few episodes so I told Dan to send me some scripts and we’d go from there. A week later “Fright Fest”, “Fame” and “Gross Anatomy” were in my inbox. “Fame” was my immediate favorite. It’s the story of a struggling actress in LA who answers an audition notice only to find out it’s for a SNUFF film. That alone was interesting to me but the fact that the actress says YES really took it to the next level. I lived in LA for over ten years and was an actor myself, so I knew what it was like for a struggling actor. I’ve seen that town just destroy people from the inside out especially young actresses who are so often judged solely on their looks alone. I felt strongly that my experiences would help lend something unique to the visual language of the episode. A BTS photo from “Fame”. The Cornerstone Mansion was my favorite location of the entire season. “Fame” would be purple I decided. Or at least have the color purple in some of the scenes. Every time I read a new script I try to determine an overall look for the piece often deciding on a dominant color. I chose purple for fame because it has a royal and majestic quality associated with it. If you take that a step further it also has an association with Christ. You often see purple at Easter which has to do with The Resurrection. Cara from “Fame” is making the ultimate sacrifice. It was going to be another piece of the visual puzzle that would help drive home the narrative. As for the other two scripts, while they didn’t hit home quite as strongly as “Fame” they each had unique elements that I thought would be challenging and interesting to film. “Gross Anatomy” was kind of a classic monster piece and “Fright Fest” had a huge scene with zombies so how could I pass that up? At the end of the day I liked the idea of having to create so many different kinds of looks and scenes with different color palettes. I decided pretty quickly that I wanted to shoot all three episodes and I’d do what it took to make it work with my busy schedule. Life imitates art in “Fright Fest” as zombies take over a movie theater during a horror film festival. When Dan and I met again to hammer out the details he told me that not only was he going to shoot a 9 episode season of “THE DEAD HOUR” but that he was also going to shoot a feature film version of the series. While Dan didn’t have a budget for “THE DEAD HOUR” series he said he was committed to raising funding for the feature film. We decided that I’d donate my time and that my rental company DEATH GRIP ELECTRIC would donate the lighting and grip equipment to the series. Then, when the movie was shot everyone would be paid. A deal was struck and we set out to shoot the first three episodes of the season. 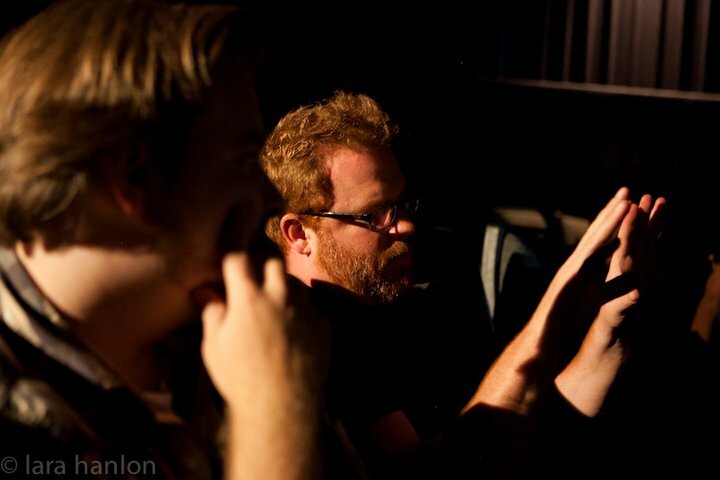 Director and Cinematographer discuss the next setup in the first episode of season 2 of “THE DEAD HOUR”. The first episode to be shot was “Fright Fest”. As production started on the season a great group of local crew came together to lend their talents to the show. As challenging as no-budget filmmaking is, it can be just as rewarding. It was no different on “THE DEAD HOUR”. As with just about every experience in life it’s the people that make it worthwhile. We were always shooting at night or on the weekends, often times for 12 hours at a time, sometimes until 4am. Keep in mind this wasn’t anybody’s main gig. Everyone was coming from a full time job or school or both. Sacrifices were being made for sure. But the crew got along well and made the tough schedule easier to swallow. There were of course tense moments but they often gave way to laughter as one thing we had in spades was a bunch of big personalities who knew how to have fun. I looked forward to almost every time we shot. This might have been Dan’s show but none of it would have been made possible without all the great people who worked on it for free. I have a bunch of great memories and friends from last year and am very thankful to the entire cast and crew. Two guys in particular really made it happen day in and day out for me and I want to single them out: Ryan Long my Camera Operator and Mason Kenton my Gaffer. They both practically never missed a shoot and helped me so much in creating the look of the show. And both of them are about the nicest guys anyone could ever meet. 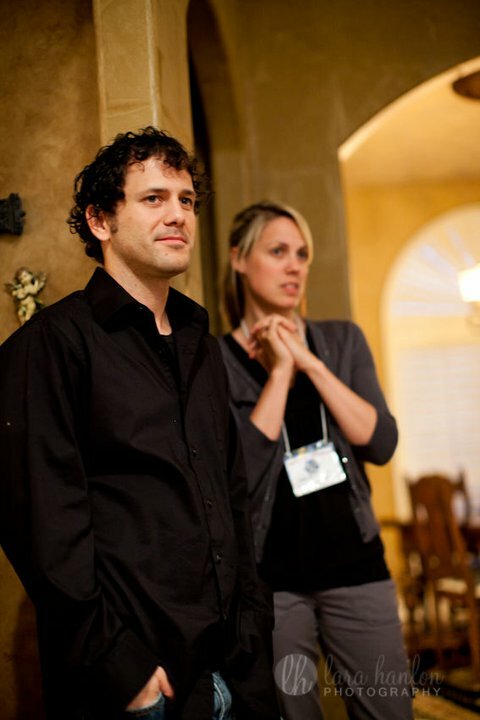 Gaffer Mason Kenton and series Executive Producer Wendy Iske look on during the filming of “Fame”. As filming progressed and the crew became closer the three episodes I agreed to became five. Somehow my lack of sleep wasn’t deterring me from showing up and everything was clicking so I decided to stay on the crazy-train a little longer. Then along came an episode entitled “Inside Man”. Scott Coleman typically writes all of the episodes of the Dead Hour but this time it was my Camera Op Ryan Long who put pen to paper. Ryan is a great filmmaker in his own right and “Inside Man” was one of the best episodes of season 2. It tells the tale of Tony, an agoraphobic who unfortunately lives in a house that’s haunted. Talk about a rock and a hard place! “Inside Man” was definitely one of the most challenging episodes to shoot as we shot both “day for night” as well as “night for day”! “Night for day” was an insane challenge as the biggest light I had was a 2k fresnel… and I only had one. We ended up shooting that scene at 2am! When it’s all said and done however I think it’s “Inside Man” that I’m most proud of. I loved how the lighting and some of the compositions turned out. If you haven’t seen it take a look. And let Ryan Long know he’s a rockstar! Andre Davis, star of “Inside Man” laughs at one of my bad jokes as I take a light reading. Season 2 ended up being only five episodes of which I shot all of them. They are “Fright Fest”, “Fame” “Backseat”, Inside Man” and “Gross Anatomy”. Unfortunately the season was cut short due to some circumstances in the Director’s private life and the feature film that was discussed never materialized. At the end of the day I never anticipated working on the entire season because I wouldn’t say I’m a fan of the horror genre. There are some horror films that I do like, such as the Exorcist, but many of them aren’t that intelligent or are just filled with mindless gore which I’m not a fan. “The Dead Hour” proved to be more psychological and therefore interested me more than the typical horror fare. I’ve decided to move on from the series. I had a wonderful time and learned an incredible amount. It constantly forced me to think on my feet. I’m a better Cinematographer for having worked on the show. With that said, working on another season I fear I would be repeating myself. After putting together my 2012 Cinematography demo reel recently I realized I needed to focus more on narrative drama and commercial work. The good news is I’ve heard that an all new season is in the works along with a feature film that will all be done this year. After all is said and done I wish Dan Iske and Scott Coleman nothing but the best and I look forward to seeing new DH in the future. Thank you to everyone who shared in the experience. To the future! Whether you’re working in fine art painting, still photography or cinematography there is one discipline that unites all of the great art throughout history: Lighting. You can’t create an image without it. This two day workshop is for filmmakers, cinematographers, gaffers, grips, electricians and anyone involved in moving images who wishes to understand the fundamentals of lighting. 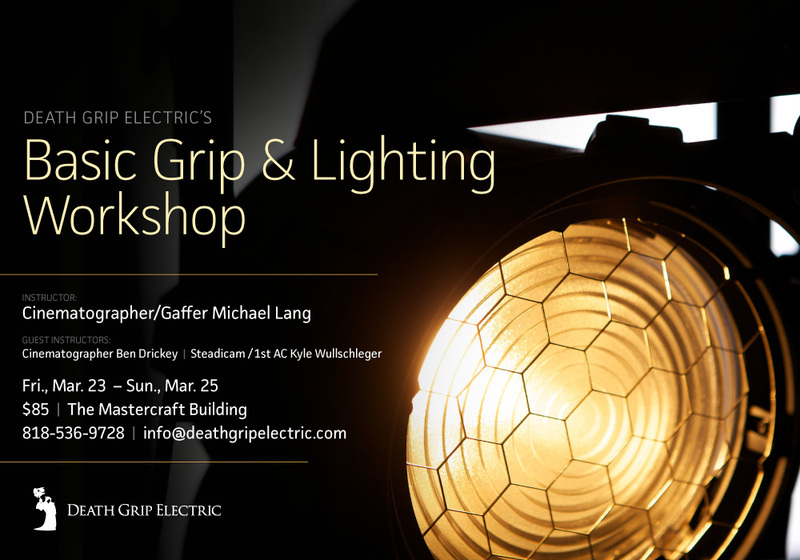 Starting with safety procedures when working with electricity and grip equipment, the class will then go hands-on and allow you to learn the finer points of setting stands, shaping light and working with HMI, tungsten, fluorescent and LED lighting instruments. Day 1 will also include Camera demos with the RED One and the Canon 5d Mark II. Discussions with theses cameras will delve into t-stops, exposure, footcandles, color and lenses. Day 2 will be almost entirely devoted to lighting exercises. We will shoot both in and out of the studio, shooting car interiors, interviews, day for night, day exteriors and dramatic interiors. We will also shoot an exercise with the new RED EPIC, shooting at 300fps and projecting the image for playback. Michael Lang of Death Grip Electric will be the lead instructor. 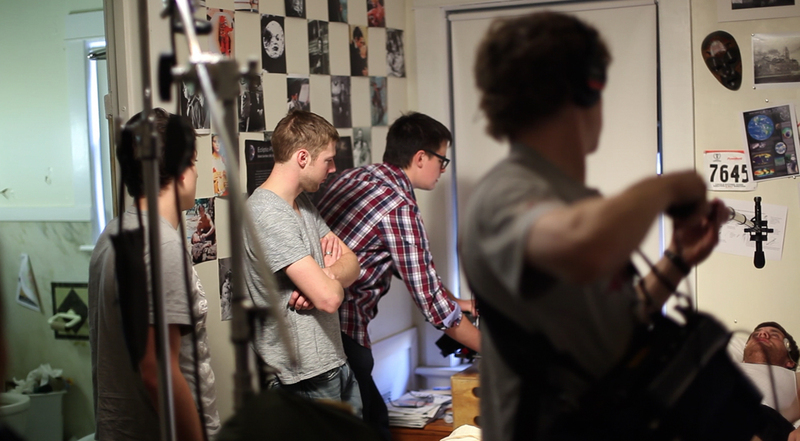 Guest instructors include Cinematographer Ben Drickey of Torchwerks and First AC Kyle Wullschleger. Please click on the names for more info. 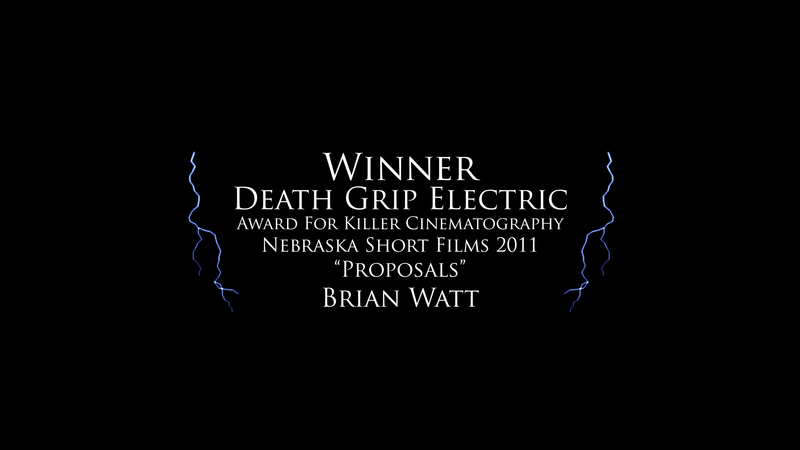 In 2011 Death Grip Electric awarded Brian Watt with a prize package for his outstanding cinematography on the Omaha Film Festival short “Proposals”. Brian won Death Grip merchandise, a plaque commemorating his win as well as up to three days of free grip and lighting rental worth over $1200.00. For someone who wins cinematography awards you might think they had a film student background. Quite the opposite. Brian is currently enrolled at UNL where he is less than a year away from obtaining a Master’s degree in – wait for it – Bio Medical engineering. This is where the story truly get’s interesting. Brian is also an accomplished Still Photographer. Not only is he nationally published but he also holds a Professional Photographer of America’s Certification as well as the degree of Master Photographer. So it’s safe to say that Brian knows how to take beautiful pictures. DP Brian Watt oversees the filming on "LUCID"
Kyle Wullschleger, an Omaha based First AC and Steadicam Operator got wind that some UNL film students were in need of some help on a Thesis Film and decided to donate his RED Epic, accessories and time to the project. Ben Drickey who owns Omaha based production company Torchwerks also donated his entire set of RED Primes to the shoot. Rhett McClure of Lincoln also loaned a RED zoom to the project. Armed with the new 5K Epic and the newest in Arri and Kino Flo lighting, Brian and Josh set off to make a fantastic short film. A 5K frame grab from "LUCID"
Death Grip Electric was proud to be able to help Brian Watt and his fellow students at UNL with “LUCID”. We are also excited to once again sponsor the Omaha Film Festival in 2012 and recognize someone for outstanding cinematography in a Nebraska short. Please call Death Grip Electric if you have any questions about the “Death Grip Electric Award for Killer Cinematography” or if you would like to rent or demo any of our grip and lighting equipment. Death Grip has the newest and best maintained lighting rental equipment in the Midwest. Things go horribly wrong in Director Josh Land's thesis film "LUCID"
Death Grip Electric has a new website and a brand new online store! We have two styles of shirts and a knitted Death Grip hat for sale. One of our T-shirts you may have seen at the 2011 Omaha Film Festival. 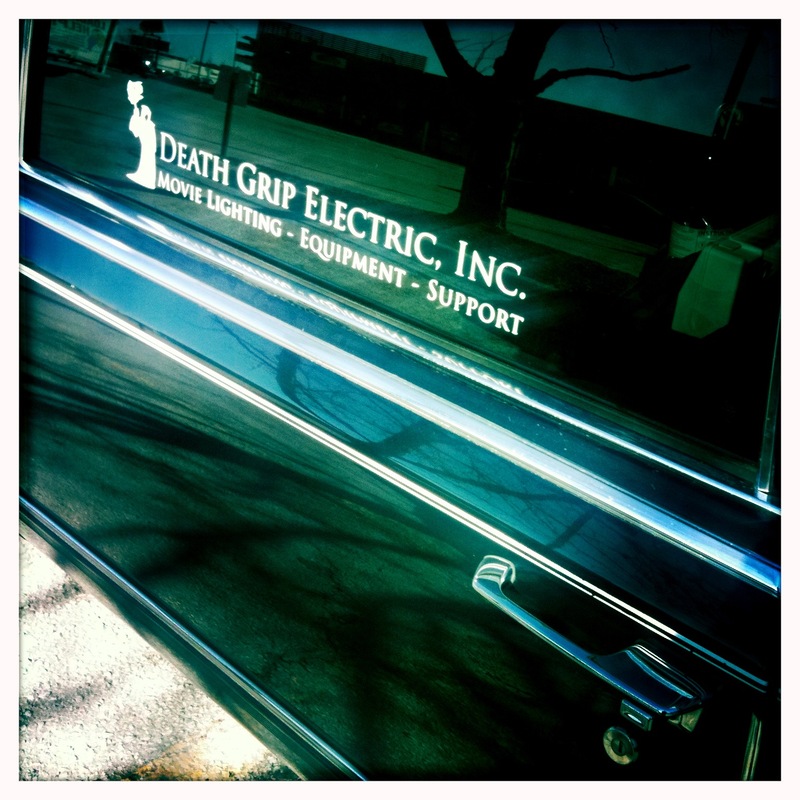 It has an illustration of our 1992 Cadillac Hearse on the front with our company name “Death Grip Electric”. We also have our brand new “Scrim Reaper” logo T! This shirt comes with a small “Scrim Reaper” logo on the left chest and our large “Scrim Reaper” logo on the back! It’s the same logo you’ll find on our grip truck! The “Dead Sled” T is $15 and the new “Scrim Reaper” T is $20. Our knitted hats are only $15! Please stop by our new WEBSITE and ONLINE STORE . And please stop back from time to time as we’ll be adding new gear soon! Death Grip Electric is an Omaha original and one of the most unique grip and lighting companies in the country! In June Death Grip was proud to do business with production companies from London, Los Angeles, Seattle and Detroit as well as the local production company Torchwerks. Call us today to reserve your grip and lighting rental and to find out about our new inventory… including our brand new Mombo Combo’s made by American Grip. They are the biggest stands in the business! Here is a scene from my award winning short film “Reservations”. “It takes a village” is something you often hear when people describe what it’s like to raise a child. The same thing applies to making movies as well. Without all of the passionate and talented craftspeople that work long hours and sacrifice so much, none of the writer’s and director’s ideas would ever make it to the screen. Those ideas would simply stay locked inside their own heads. I owe a tremendous debt of gratitude to all of the wonderful people who donated their time to “Reservations”. Without you none of this would have been possible. Our win at the Omaha Film Festival is a win for everyone! Brian Watt for the Nebraska Short “Proposals”. 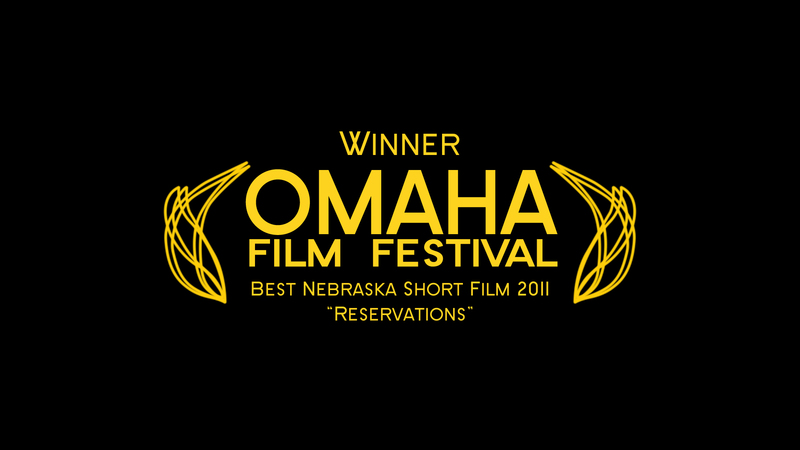 This film screened with Nebraska Shorts – Block #1 on Friday March 4th at the 2011 Omaha Film Festival. This award is given based on superior achievement in visual storytelling and lighting. Brian’s use of movement, impeccable framing, color palette and eye for lighting brought director Alex Jeffery’s vision to life in a unique way. Brian has won Death Grip merchandise, a plaque commemorating his win as well as up to three days of free grip and lighting rental worth over $1200.00. Mr. Watt is already an accomplished still photographer and his foray into cinematography proves that he is a force to be reckoned with. For more information on Brian please visit his personal website. Death Grip Electric looks forward to working with Brian on his next project. We hope that by providing these resources to Nebraska cinematographers they can push themselves to create astonishing work and inspire other cinematographers and filmmakers to do the same.